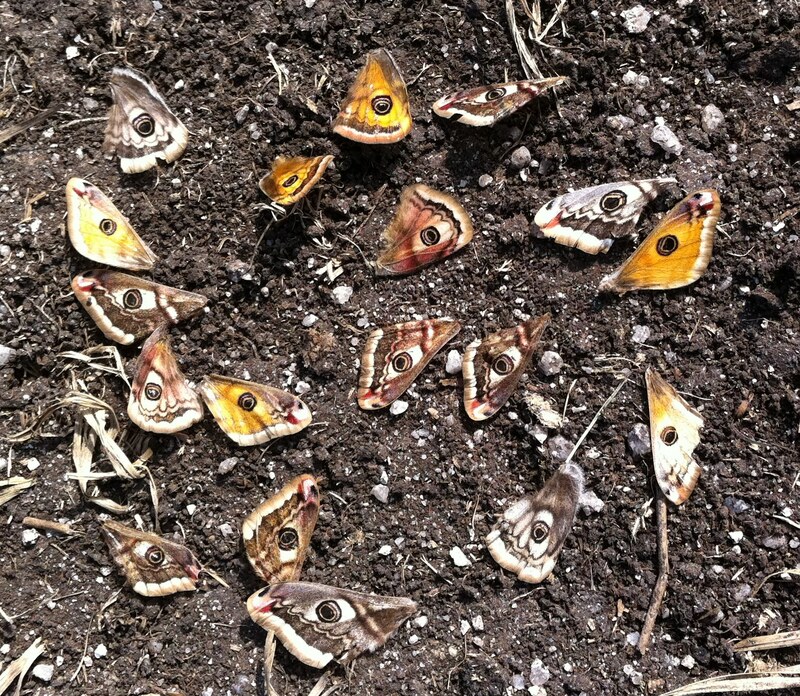 Over the past few days in this sunny weather Dartmoor has been heaving with Emperor Moths. I have been out on the moor 7 times in the last two weeks and have seen hundreds and hundreds of emperor moths flying quickly and purposely across the high moor. Emperor moths are large day flying moths with large eye spots which are supposed to deter predators – the theory is that the large eyes fool the predator into thinking that the moth is in fact a large face with a pair of eyes! Female emperor moths also emit a pheromone which attracts male moths from miles around to breed. Well – does the large pair of eyes theory work? Look at the picture below. I was out on the moor today between Sittaford Tor and Quintin’s Man with my friend Steve Brayshaw when we stumbled across nearly 20 Emperor moths wings but no bodies. We had never seen anything like this before but here is our theory. A female moth had managed to attract a large number of males (most of the wings in the picture are males) and a mating frenzy was in progress in broad daylight! (day flying moths remember). This scene attracted the attention of a moorland bird or two – most probably meadow pipits which are common in the area who then attacked the moths discarding the wings but eating the bodies. Either way, get up onto the high moor if you want to see hundreds of emperor moths roaring around. This entry was posted in Dartmoor wildlife and tagged Moths, Wildlife. Bookmark the permalink. interesting – are they only on Dartmoor? Haven’t spotted any emperor moths over here in the middle of Devon but then I haven’t particularly been searching. Hi – emperor moths are common this year on Dartmoor – the caterpillars feed on heather and bilberry. It does seem to be an exceptional year for them on the moor – I have never seen anything like it!